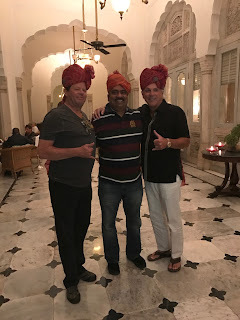 Feb 2017: With leading polarized sunglass maker Maui Jim planning its next expansionary thrust in India, its top global leadership including Founder-CEO Walter F Hester and President Mike Dalton paid a fortnight-long visit to the country to explore the growth potential of the rapidly growing economy. As part of the visit, the duo travelled across the length and breadth of the country, and took a first-hand account of the fashion and technology market. During their 15-day stay in India, the duo visited prominent cities and markets including New Delhi, Mumbai, Chennai, Hyderabad, Kolkata and Jaipur, among others, and interacted extensively with market experts and dealers who have their ears close to the ground. Notably, this is only the second visit of the company’s top leadership team to India; the first being in 2008 when Maui Jim made an entry into the Indian market. The leading technology sunglass brand will complete 10 years of presence in India next year, and is eyeing a fresh phase of growth and expansion. Walter F. Hester has been at the helm at Maui Jim since 1986, and it was under his leadership that Maui Jim pioneered the patented PolarizedPlus ® lens technology that wiped out glare and UV rays. Maui Jim then took the technology a step farther with PolarizedPlus2 ®, adding three rare earth elements that naturally enhance colors. As President and COO, Mike Dalton oversees all global operations for the company, including operations in over 100 international markets. The visit comes as Maui Jim embarks on the next phase of growth in India, having accomplished a firm footing in the Indian market and a loyal clientele. “This visit helped them gather first hand information on the huge growth and expansion potential in the Indian market. Much has changed in the Indian market since our top leadership team last visited the country in 2008. The fashion and technology market has grown leaps and bounds. The sunglass market specially has evolved tremendously over the past 10 years, with a major shift being witnessed today towards the technology wear segment. More people today are aware of the health benefits of UV protection. Moreover, they are willing to spend on quality branded sunglasses. India is a highly dynamic market today and Maui Jim is working to expand its base substantially over the next five years,” says Mr. I Rahumathullah, Managing Director, Maui Jim, India. The duo also closely studied the company’s dealer network and held intense discussions on the growth prospects in the Indian market. Maui Jim sunglasses have been recommended by The Skin Cancer Foundation as an effective UV filter for the eyes and surrounding skin. Maui Jim offers more than 112 styles, four lens colors, five lens materials and prescription capabilities in more than 400 SKUs. Maui Jim sunglasses were born on the beaches of Maui and designed to protect eyes from the harsh rays of the island sun. Today, Maui Jim is recognized for unparalleled “Aloha Spirit” and customer service as well as their patented PolarizedPlus2® lens technology, which blocks 100% of UV rays and eliminates glare while enhancing color, definition and depth perception. Maui Jim sunglasses have earned the Skin Cancer Foundation Seal of Recommendation as an effective UV filter for the eyes and surrounding skin. For more information, visit mauijim.com, follow us on Facebook, or on Twitter and Instagram at @OfficialMauiJim.